John N. and Elizabeth Causins Travers established a 30-acre farm here in 1832, when Arlington was rural and had less than 1,500 inhabitants. Over the years the land was subdivided. Descendants and kin lived here, contributing to the life of Arlington into the 20th century. The graveyard on family land continued a burial tradition common in the rural south. 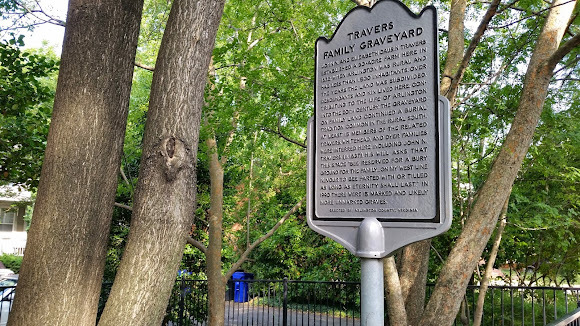 At least 15 members of the related Travers, Whitehead, and Dyer families were interred here, including John N. Travers (d. 1837). His will asks that this space "bee reserved for a bury ground for the family...on my west line nevour to bee parted with or tilled as long as eternity shall last." In 1990, there were 15 marked and likely more unmarked graves. The oldest grave is apparently from the 1830's, which in many respects isn't that long ago. But man, have times changed. I'd love to see someone try to get a family burial ground past the typical HOA board. Still, it might be less painful than say, trying to build a streetcar. Thanks to my Brother David for taking me on a running route that passes the cemetery. I do love discovering something new and unusual on a run, and a front-yard graveyard definitely meets that criteria! Discover the graveyard for yourself by running in this neighborhood. This church means that we're one connection away from the freed slaves of the Civil War. Amazing.